Can Tim Howard cash in on his big game? 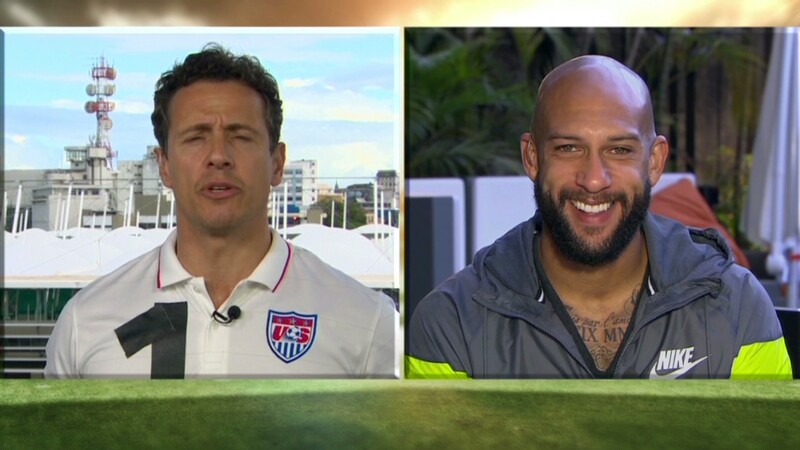 Tim Howard was an American hero on Tuesday. But can he become an American marketing icon? The hero goalie is set up to capitalize mightily on his World Cup soccer performance, setting a record for saves in keeping the U.S. team close in its elimination match against Belgium. "Given the desire for a squeaky clean, attractive, personable spokesperson, the endorsement potential is probably unlimited," said Henry Schafer, executive vice president the Q Scores Company, which measures the consumer appeal of celebrities and brands. Even though the U.S. lost 2-1, Howard was named Man of the Match -- unusual for a losing team player. "The fact that he had 16 saves, it's given him top awareness, it's adding to his popularity right now," said Schafer. "Is he going to take advantage of this newfound awareness in the U.S.? He's got to strike while the iron is hot." Howard -- who plays professionally for the Everton Football Club in Britain's Premier League -- has a net worth of about $10 million with annual earnings of $3 million, according to www.celebritynetworth.com. He could add another $1 million to his annual income through endorsements, according to Bob Dorfman, sports endorsement expert and executive creative director for the Baker Street Advertising in San Francisco. "He now qualifies to pitch any product that protects well -- Rust-Oleum, safe family cars, deodorants -- or any financial service talking about saving," said Dorfman. He already has a sponsorship with Nike (NKE), which sponsors the entire U.S. team. It's unclear how much that's worth, since Nike did not return messages from CNNMoney. "I'm assuming his Nike contract could be quite lucrative," said Corinna Freedman, Nike analyst for Wedbush Securities. Howard has thus far maintained his wholesome images as professed Christian and family man. So the biggest hurdle for Howard isn't staying out of trouble, it's simply staying famous in a nation where soccer has -- until now -- nowhere near the visibility of other sports. "The big challenge for him is that while he's now a household name and face, we won't see him in another World Cup for four more years, and until then you'll have to watch Everton matches in the English Premier League to see him in goal," said Dorfman. "He's really going to have to jump on this, as much as possible." But in an interview with CNN's New Day, Howard acted like he was going to do the exact opposite -- at least for now. When asked about his future plans, his response was laid back and introverted: "I'm going to go home and I'm going to relax and hide away, hang out with the kids, get some more tattoos, you know, just be me."